​Local cloud computing and data center services firm IPC (IP Converge Data Services, Inc.) recently launched a cloud service bundle specifically created for startups and small-to-medium enterprises. The special program includes software-as-a-service (SaaS) products from IPC’s portfolio that enable businesses to streamline operations and effectively go to market faster, namely, Google Apps for Work online productivity and collaboration tools and local timekeeping and payroll management application IPC PayCheck. The two products may also be coupled with dedicated Internet access for enterprises, and the program is available until December 2015. Huergas further shared that availing of the bundle presents customers with savings of up to 20 percent, versus subscribing to the services and apps separately. The program also provides a single contract, contact and billing for all services, creating a seamless, hassle-free adoption of all the cloud computing tools. The bundles come in three packages. Entrepreneurs can pair Google Apps for Work licenses with either IPC PayCheck or IPC’s Global Internet Access, or subscribe to all three services at once. Google Apps for Work is a set of cloud-based productivity and collaboration tools that helps team members collaborate and get things done from anywhere, on virtually any device. The suite includes easy-to-use apps for email, calendars, video-conferencing, chat, document sharing and online storage. With Google for Work companies have their own domain as opposed to @gmail.com which is used in the free version. In addition, administrators are able to assign access rights to users and manage all facets of the account via the Internet. 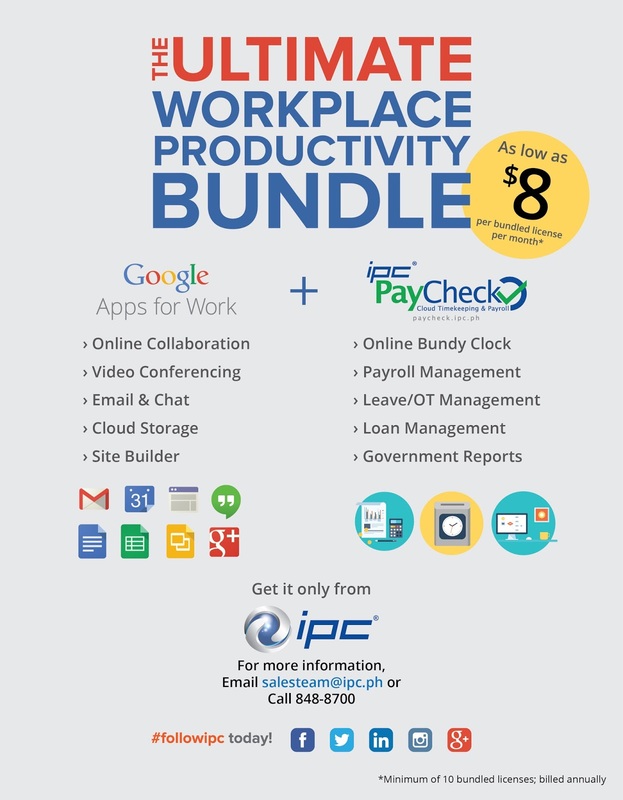 IPC PayCheck is a cloud-based timekeeping and payroll application that provides employees with access to timekeeping functionalities and services such as leave and overtime management, as well as pertinent employment information, 24/7 on any mobile device connected to the Internet. The administrator profile provides HR managers with a single view of relevant, real-time reports through a built-in dashboard that’s also accessible on mobile. IPC’s Global Internet Access (GIA) service provides customers with high capacity Internet connectivity through a robust, diversely-routed IP backbone network. Because IPC is peered and partnered with all domestic and major regional telecommunications carriers, GIA users experience highly resilient Internet bandwidth services that is ideal for utilizing Google Apps for Work and IPC PayCheck. The program features an annual payment scheme and requires a subscription of at least 10 licenses for Google Apps for Work and PayCheck or 1 Mbps for Global Internet Access. Packages do not include professional deployment services, nor local loop or leased line subscription. “Startups and SMEs today appreciate how cloud computing can help streamline their processes and improve productivity. However, the initial capital outlay needed for a complete suite of tools often pose as a challenge. IPC is changing that through the bundle program and other pricing models. Our goal is to help these businesses go to market sooner and experience profitability faster,” Huergas explained.